The US refused to participate in the 26 March multilateral meeting on the situation in Syria’s Rukban camp and keeps preventing Russian, Syrian and UN officials from reaching the humanitarian catastrophe zone. The US is refusing to let Syrian government representatives, international organizations and Russian Armed Forces into the illegally occupied al-Tanf zone in Syria because it wants to hide crimes being committed against civilians in the notorious Rukban camp, a statement from the Russian and Syrian Joint Coordination Committees on Repatriation of Syrian Refugees says. The statement was issued in the wake of a multilateral meeting on Tuesday of Russian, Syrian and UN representatives over the situation in the refugee camp, where some 40,000 people are struggling without reliable access to the most basic commodities, such as food, clean water and medicine. "The position of the command of the American troops is puzzling. 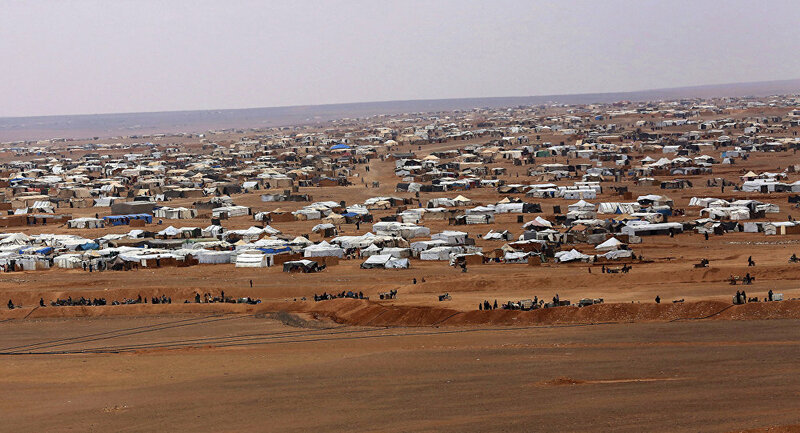 They themselves invaded the territory of Syria, illegally occupied the 55-kilometer zone of al-Tanf and, under false pretences, blocked humanitarian initiatives to disband the Rukban camp. Despite the assurances of our American partners about joint cooperation, their goal is clearly not to save Syrian citizens dying from insanitary conditions, hunger, cold and diseases," the statement, published on the Russian Ministry of Defense website, reads. "By their actions, the American side is trying to hide crimes against the civilians in the zone under their control. There is simply no other reasonable explanation for the unconstructive behavior of the American side." The US was the only side involved that refused to participate in the meeting between representatives of the offices of the UN High Commissioner for Refugees in Syria, the Office for the Coordination of Humanitarian Affairs of the UN Secretary General, the Russian Embassy in Syria, the Ministry of Local Administration of Syria, the Syrian National Reconciliation Committee and the president of the Syrian Arab Red Crescent, as well as the sheikhs of the tribes in the Rukban camp. According to the statement, the command of Russian Armed Forces in Syria received a response from US Lieutenant General Paul J. LaCamera, the commander of Operation Inherent Resolve, in which he reportedly committed "to the fundamental principles of the UN in resolving the problem of the Rukban camp," but refused to participate in the very event designed to — in cooperation with UN representatives — develop a roadmap for disbanding the camp. "The American side, which is directly responsible for what is happening in the al-Tanf zone, which they illegally occupied, ignored the initiative aimed at saving the people of the Rukban camp and refused to participate in the meeting," the statement reads. The meeting still took place, even without US participation, and revealed "a clear understanding by the participants of the need for the speedy disbanding of the Rukban camp and the evacuation of its population to the territories controlled by the Syrian government." The statement, signed by head of the Russian Joint Coordination Committee on Repatriation of Syrian Refugees Mikhail Mizintsev and his Syrian counterpart, Hussein Makhlouf, urged the US representatives to participate in the next meeting scheduled for 2 April 2019, which will allow the development of "concrete joint steps to disband the Rukban camp." In January, the World Health Organization described people residing in the camp as "trapped," adding that they live "in deplorable conditions." Limited water supply, bitterly cold weather and poorly functioning health care facilities have contributed to the rise of diseases, which include influenza, measles, tuberculosis and chronic respiratory diseases, according to the organization. Syria and Russia have repeatedly accused the US of preventing the refugees from being evacuated from the camp. On 23 March, some 360 refugees were able to leave the camp, thanks to a humanitarian corridor established by the Russian military, according to Russian Colonel General Viktor Kupchishin.